Today sees the release of a second trailer for Joseph Kosinski’s Oblivion, Back in December is when we got our first look at the film and now, with this second peek at the upcoming sci-fi movie, we get an even better look at the slick and polished world that Kosinski is preparing for us. 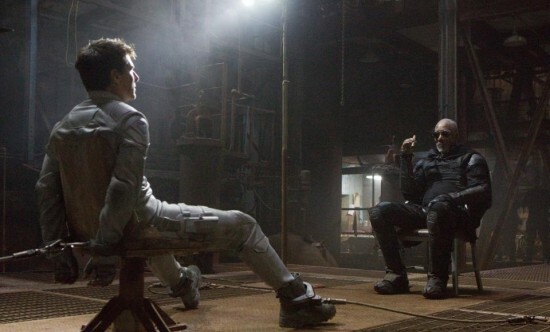 In addition to the new footage, we also get a better understanding of the plot and the conflict that will propel the story forward, which Tom Cruise finds himself in the middle of. It’s intriguing stuff, but given the fact that Kosinski made a bit of a mess out of his last film, Tron: Legacy, I’m going to remain cautiously optimistic here. That being said, Cruise looks solid as always and the visuals seem impressive, given what we can see in the trailer at least. The post-apocalyptic Earth that Kosinski has created looks both beautiful and striking and despite coming off as a bit generic in terms of plot, I think the film will still be a strong entry into the sci-fi genre. Like I said above, Tron: Legacy was a bit messy but Kosinski is working with a better cast this time around and already this film is looking better than his last. Oblivion will debut exclusively in IMAX theaters on April 12th, 2013 and in regular theatres a week later. Check out the new trailer, along with the plot synopsis, below and let us know what you think.